Can you edit better than a third grader? I don’t know what it is with the N&O’s editing, or lack thereof. It seems particularly bad for the sports section. 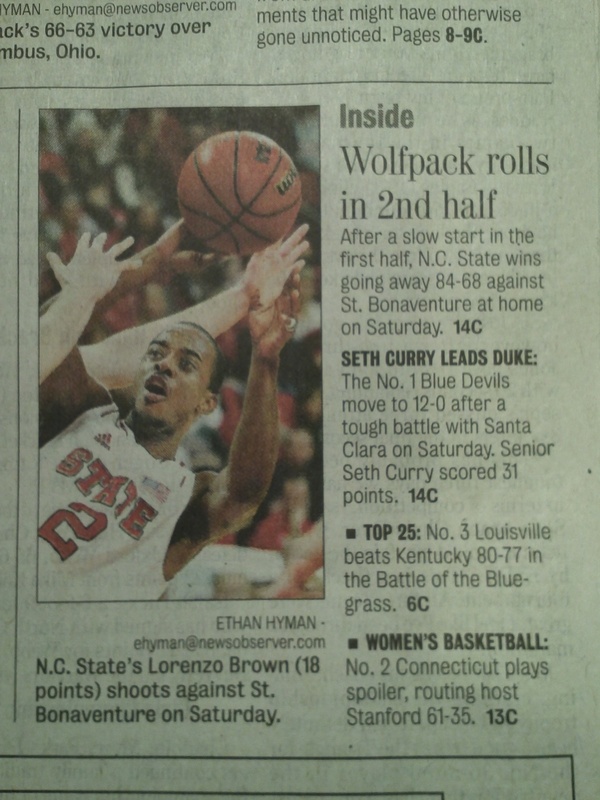 It may due to my bias for the N.C. State Wolfpack but it seems there’s a general lack of knowledge for State coverage. I don’t know because I usually only skim the Duke or UNC stories. N.C. State’s basketball team beat Western Michigan yesterday in a game in Raleigh. Sports writer J.P. Giglio wrote a good story on the game, but because Giglio referenced last week’s game against St. Bonaventure, whomever supposedly edits the sports page listed St. Bonaveuture as yesterday’s opponent on the front of the sports page. Just like the previous game against St. Bonaventure, Richard Howell fouled out Saturday against Western Michigan. The Pack played Western Michigan, not St. Bonaventure. Fewer than two weeks ago, the sports page flubbed the name of N.C. State’s basketball coach in a photo caption on the front of the sports page, calling him Mike Gottfried instead of Mark Gottfried. This error didn’t get by my eagle-eyed 8-year-old son, Travis, so why in the world did it get by the paper’s editors? The N&O has a chance to offer the best coverage of local sports, and generally the paper does. For many subscribers, sports coverage is very important. 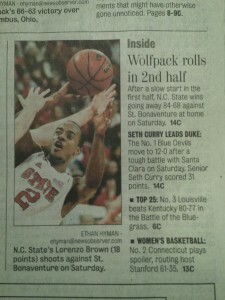 That’s why I’m mystified that the N&O has let its sports editing get so bad. It may be enough to drive people away from the newspaper.